Chaldean Catholic bishops from around the world are meeting in Erbil, northern Iraq, for a five-day synod despite the security crisis in their country that involves persecution of Christians. The synod, which began on June 24, in the town of 30,000 people was originally scheduled to meet in Baghdad to discuss internal ecclesial issues, the Catholic Culture website reported. The recent dramatic developments in Iraq prompted the shift of the meeting venue to the city in Iraqi Kurdistan, a region not involved in the conflict. Salama al-Khafaji, a member of the U.N. High Commission for Human Rights in Iraq, told the Arabic-language Alsumaria News, ISIS "is imposing on Christians a minimum payment of $250, with [the] amount varying depending on the type of work/profession performed by Christian citizens." ISIS is also known as the Islamic State of Iraq and the Levant (ISIL). In one instance, ISIS members entered the home of an Assyrian family in Mosul and demanded the poll tax (jizya). 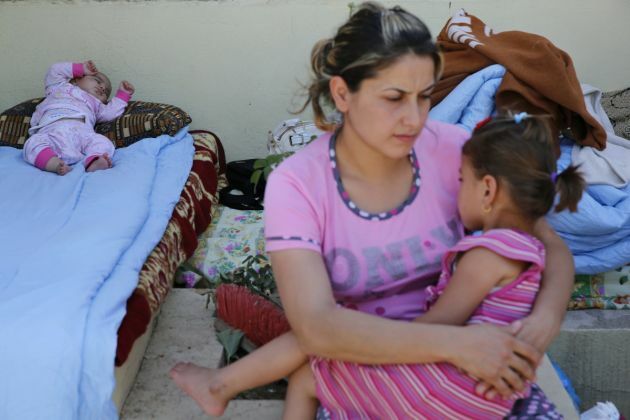 When the Assyrian family said they did not have the money, three ISIS members raped the mother and daughter in front of the husband and father, reported AINA. The husband and father was so traumatized that he committed suicide. "The Christians have told me that they cannot pay this tax," said Al-Khafaji, "and they say 'what am I to do, shall I kill myself?'" A spokesman for the Chaldean Catholic patriarchate told the Fides news agency, "Obviously the new situation in Iraq involves a change of program. "The bishops will evaluate new emergencies that mark the condition of the Christian community and across the country." Headquartered in Baghdad, the Chaldean Catholic Church is an Eastern Catholic church in full communion with the Holy See. It has eparchies (dioceses) in nine nations, including the United States, and has an estimated 419,000 members, Catholic Culture said. Syrian Christians face direct attacks on them and they also get caught in the crossfire of battles. The Catholic Fides news agency reported that the town of Qaraqosh, an historic Christian town near Mosul, is almost a ghost town. It said more than 90 percent of the more than 40,000 inhabitants, nearly all Christians of the Syrian Catholic Church, had fled in the preceding two days due to the Sunni insurgents offensive led by ISIL. It is subjecting the area to rocket and grenades attacks. The Syrian Catholic Archbishop of Mosul, Yohanna Petros Moshe, said a few priests and some young people of his church are among the few left in the city. Residents said weapons and new contingents have arrived to strengthen the Kurdish Peshmerga militias that oppose the advance of the Sunni insurgents as if preparing for a confrontation. On Thursday Archbishop Moshe unsuccessfully attempted to mediate between the opposing forces with the intent to preserve the city of Qaraqosh from being destroyed. Archbishop Moshe told Fides, "Before the tragedy being experienced by our people, I appeal to the consciences of political leaders around the world, to international organizations and to all men of good will. "It is necessary to intervene immediately to put a stop to the deterioration of the situation, working not only at a humanitarian level, but also politically and diplomatically. "The world cannot turn a blind eye to the tragedy of people who have fled from their homes in a few hours, taking with them only the clothes they are wearing." Syriac Catholic priest Nizar Semaan, who works with Moshe told Fides that the appeal "is also addressed to Western and European governments that often speak of human rights, and sink into a comfortable silence when their operations and their analysis of the problems of the Middle East prove shortsighted and disastrous. "To be clear, the archbishop does not ask to resolve the situation by sending more weapons to the Middle East."